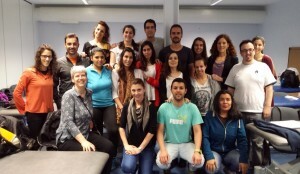 Physiotherapy and occupational therapy lecturers recently visited the Instituto Politécnico do Porto in Portugal on an Erasmus funded staff exchange. HAZEL HOROBIN from the School of Health Sciences, taught both undergraduate and postgraduate physiotherapy students over four days taking both seminars and practical classes. The students were keen to understand UK perspectiv es on the physiotherapy management and treatment of chronic lung disease and explore contemporary approaches to pulmonary rehabilitation and differences in terms of approach in relation to both advice and exercise were discussed. TARA SIMS and PAUL BOYLE taught undergraduate occupational therapy students and explored issues relating to the care of children and young people with conditions such as congenital limb deficiency and cerebral palsy. Tara and Paul benefited from being able to share experiences and compare approaches to occupational therapy in the UK and Portu-gal. The staff were extremely welcoming and supportive, and it represents a really lovely place to go on such an exchange. Porto is the second largest city in Portugal and has always rivalled Lisbon in relation to economic power, and the Ribeiro (riverside) is a world heritage site, which makes for an amazing place to see as well as work. Hazel, Tara and Paul look forward to welcoming their Portuguese colleagues to Brighton in due course. Tagged ERASMUS, HAZEL HOROBIN, Occupational therapy, Occupational Therapy BSc, Paul Boyle, Physiotherapy, Physiotherapy BSc, physiotherapy management, Physiotherapy MSc, Politécnico do Porto, Porto, Portugal, pulmonary rehabilitation, Tara Sims, treatment of chronic lung disease, UNESCO. Bookmark the permalink.